and stamped the bottom panel with Bordering Blooms in Soft Sky for a nice subtle look! Added a little Soft Sky banner and some fussy-cut flowers, and it was done! You can tell how thrilled she was to have her picture taken! I do love your creations, they are all so fabulous, very creative lady! These colours are gorgeous together and a stunning layout, along with your amazing designer paper! I also love to know what's going on with dear little Cassidy, she always manages to make me laugh...look at her face! Lovely custom DSP! Those sweet flowers paid up with the burlap ribbon is a great combo! A sweet 'hello' card to brighten someones day! Thanks for sharing at Fab Friday! Wow, what a great application of the burlap ribbon! I'm always too chicken to get it out, lol, but you've inspired me! And I love seeing Pumpkin stamps out for a walk! Thanks so much for playing at Fab Friday! So sweet! Love the little flowers and your beautiful sunshine, perfectly embellished too! Thanks for joining us at Fab Friday, hope to see you again soon! Thanks for your comments on my "Biking in the Country" card. I started using Inkscape about a month ago. It is easier to create free hand drawing than PowerPoint. I like your burlap here. I have yet to figure that out in Inkscape but I am pretty sure it is doable. It took a few hours to figure out in PowerPoint. The burlap in your card seems to integrte the rest of the colors. Youhave a great card. Your success with burlap make me more determined to have burlap in my cards again. Love the color combination on this card! The T looks T-rrific on Cassidy and her glasses really are adorable on her. I wore glasses at this age and hers are perfect for her!! Terrific texture from the ribbon, this is wonderful!! Ohhh that Cassidy is too much fun!! Hooray, LeAnne. I am so happy you joined us! Love your pretty floral card and that shirt is adorable! I love minions! Thanks for joining us at SugarPea Designs! Beautiful card - loving all that texture!!! 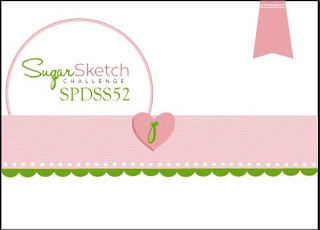 Thanks so much for playing along with us at SugarPea Stamps. Lovely card, LeAnne! I love the burst of fun on the top panel of the card. Thank you so much for playing along with this FabFriday color challenge. SO happy to have you playing with us, LeAnne! Your card showcases the challenge colors beautifully. I love the pretty background you stamped and the homey feel of the burlap. It all works together perfectly.